Imagine if you could break free from the limitations of synthesizer presets and create your own custom sounds to fit your music. The first step toward that goal is to understand the standard synth parameters that you see on most instruments. Once you do, a whole new world of sonic control and creativity will open up for you. 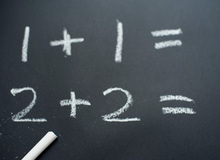 In this two-part article, I’ll explain those parameters to you in a clear, understandable way. You’ll learn the meaning of amplitude, ADSR, pulse width, resonance and a lot more. While our recent series on synthesis was centered around how different types of synthesis work, this series will focus more on preparing you to start programming your own sounds. The best way to think of a synthesizer is as a collection of building blocks. 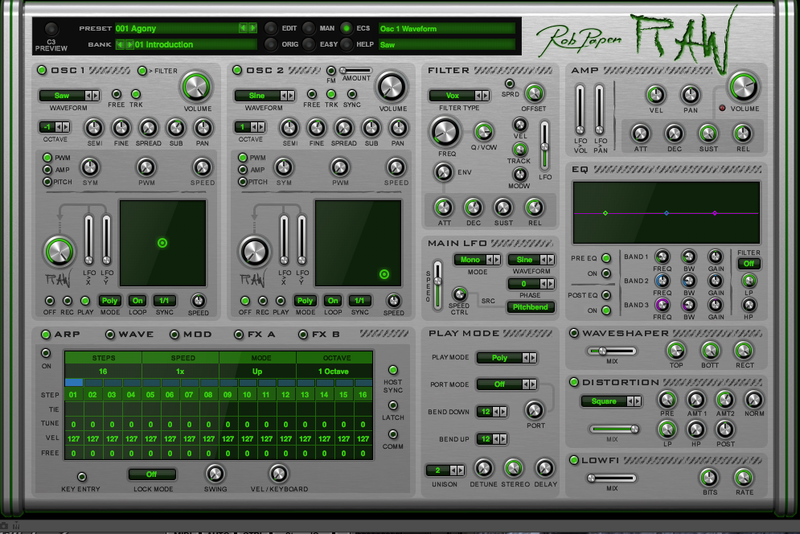 For example, notice the separate parameter sections in Rob Papen's RAW synth. So, exactly what are parameters, and how does a parameter differ from a parameter value? In the world of synthesizers, a parameter is any aspect of a sound that contributes to what you hear when you press a key on the keyboard. A parameter could be acoustic, like loudness or pitch, or it could be electronic, like cutoff frequency or modulation depth. A synthesist controls the parameters of sound by changing the values of those parameters. Take loudness, for example: when you raise the loudness level from 0 to 100%, you’re changing the value of the loudness parameter. Likewise, anytime you turn a knob on a synthesizer’s front panel, that knob controls a specific parameter, and turning it changes that parameter's value. The most basic acoustic parameters are loudness, pitch, duration and timbre. Manipulating those parameters lets you turn raw sound into music. It helps to think of a synthesizer as a collection of building blocks. The way those blocks are arranged — the instrument’s architecture — determines their signal path. Most synths share a common architecture, more or less, no matter whether they’re hardware or software. Signals from an oscillator pass through a filter and an amplifier controlled by envelope generators and LFOs. Each building block has its own set of parameters, which I’ll explain. For our purposes, amplitude is just another word for loudness. Every sound has a beginning and an end, and its amplitude changes over time. When you whack a cymbal with a stick, its sound instantly jumps to full amplitude and then dies down gradually until it disappears. Changes in the sound’s amplitude between its beginning and end are called the sound’s envelope, and you can view those changes in the graph to the left. An envelope has different stages. The beginning of a sound is called its attack. An attack may be fast, like a cymbal crash, or it may be slow, like this cymbal roll. The attack tells us more about how an instrument is played than anything else. When a sound ends, it may stop suddenly, or it may take a few seconds to die away completely. The envelope’s final stage is called its decay, for reasons that should be obvious. Synthesizers can control every sound’s amplitude using an envelope generator. When you play a sound on a synth, an envelope generator determines how its amplitude changes from start to finish. Listen to how this sound changes over time. Most envelope generators have four stages: attack, decay, sustain, and release. For that reason, four-stage envelope generators are also called ADSR generators, and a knob or slider is usually available for controlling each stage. When you press a key on a synth keyboard, the envelope generator’s attack setting determines how quickly the sound’s amplitude rises from its zero value to its maximum level. Then, as you hold down the key, the decay stage determines how quickly the amplitude falls from the maximum down to a steady level. You specify that level with the sustain setting, which must be less than the maximum level for you to hear the difference.The envelope generator holds the amplitude at the sustain level until you release the key, at which point the amplitude returns to zero at a rate determined by the release setting, and the sound ends, as in this example. But if you release the key before the amplitude reaches the sustain stage, the envelope jumps straight to the release stage. Consequently, the attack, decay and release settings determine lengths of time, and the sustain setting determines a level. This classic illustration helps to visualize the four stages of an ADSR synthesizer envelope. Most synthesizers have at least two envelope generators—one to control the amplifier, and another to control the filter. But before we look any further, it helps to have a good understanding of timbre. Timbre (pronounced tam'–br, like tambourine, not tim'–br, like when a tree falls) is the same thing as tone color. Although it’s difficult to identify a musical instrument simply by the pitch or loudness of the sounds it makes, differences in timbre are how we most often distinguish one instrument from another. When a musical instrument causes the air around it to vibrate, we call the individual vibrations waves or cycles and the rate of vibration frequency. We perceive frequency as pitch—how high or low you hear a sound on a musical scale. Synthesizers can produce sounds with a very wide pitch range. Most musical sounds are complex combinations of simple sine waves, each with different amplitudes and frequencies. Their frequencies are often whole-number multiples of each other called harmonics. A sound’s harmonic content (also called spectrum) determines its timbre. The harmonic with the lowest frequency (and usually the greatest amplitude) determines the sound’s musical pitch and is called the first harmonic or fundamental frequency. Higher harmonics are called overtones, and they’re usually weaker in amplitude than the fundamental. I hope this article gives you enough background to tackle what lies ahead. Next time, we’ll explore oscillators, filters, LFOs and all the various parameters you can manipulate to create sounds of your own. I’ll also explain more about how you can use envelope generators to shape your sounds.